When you look at this picture what do you see? The obvious answer is a little boy at a wrestling match. But things aren’t always as they seem, and sometimes you have to look beyond what’s in front of your face. You see, my son has invisible disabilities. I have two children. My daughter rides in a wheelchair and uses a communication device. The world sees her disability. It flashes like a blinking neon sign. But when you live in a world where appearances mean everything, it’s hard for people to understand why my bouncing, bubbly son, Marvin, has disabilities. I know they meant well, but a lot of times I wanted to snap back and say, “So did everyone else get abused and exposed to drugs in utero?” It just made me mad. His preschools insisted he was just fine, too. They pointed out other kids and told me he was just a boy. But Marvin isn’t like everyone else. He has many invisible scars. He was born addicted to meth and abused. He was medi-flighted after his biological mom shook him until he lost consciousness. My son lives every day with the damage inflicted upon him. He has PTSD, shaken baby syndrome, ADHD, detached retinas, trauma, dysgraphia and other learning disorders. Every time I turn around, it seems like a new diagnosis is added. They’re all tucked away in his soul. We deal with each issue daily. We go to therapies; our house often looks like a giant sensory room so my son can get the input his body craves. I also fight daily for his needs. For a child who looks and, most of the time, acts like everyone else, it’s hard for people to understand why he needs so much. With my daughter, they shower me with equipment, therapies, doctors and specialists. With my son, I’m often left on my own with doors shut in my face. I get funny looks when I try to explain about his needs. There is something else you won’t see in the picture either. It’s how proud I am of my son. He lived through things you or I can never imagine. He’s a survivor. He has to work harder than the average 8-year-old to do things that children take for granted, like writing a couple of sentences. But he has come such a long way. Every time he makes a new gain, figures out school work, manages to stay in a crowded noisy area without coming undone, he just beams. 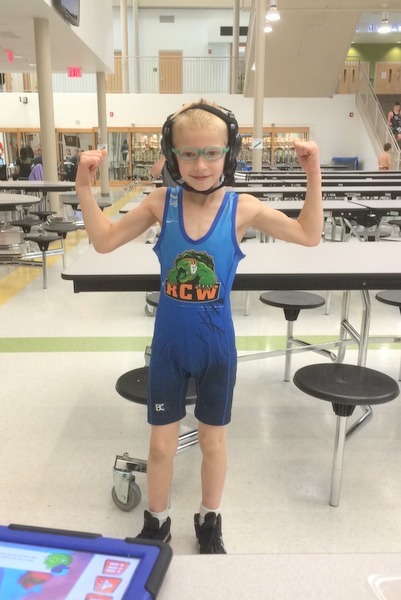 I took that picture after his wrestling meet. You see a kid beaming with pride. I see a warrior who is going to take the world by storm.